You’re designing your wedding cake, and it’s time to make the big decision: which icing should you pick?! You may already have an icing option in mind, however it is important to choose the right icing for your cake by taking into consideration the cake design, the venue’s temperature, and length of travel. Here at Sweet Bites we mainly use four different types of icing: Buttercream, Fondant, Chocolate Ganache and Royal. In this blog post we will talk you through each one, and discuss the pros and cons of each. Hopefully after reading this post you will have a better understanding of each of the icings, and will be able to choose which icing is right for you! Buttercream icing is the icing everyone knows and loves. It is made from butter, icing sugar and vanilla seeds, mixed together to create a soft, light consistency. Buttercream icing can also be coloured and flavoured to your liking, by adding chocolates, fruit flavours, caramels… the possibilities are endless! This is the icing everyone is used to, as it is regularly used on cupcakes and birthday cakes. 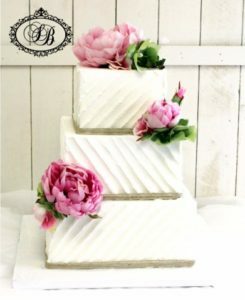 If you are wanting a less traditional, rustic or laidback wedding cake, we would suggest using buttercream icing! As buttercream is so soft we can easily put it into a piping bag to do intricate flowers, borders and designs on your cake. Buttercream is also great for cake textures such as rosettes and ribbing. Although buttercream will never give the polished appearance of fondant, some people actually prefer the textured look buttercream icing gives. 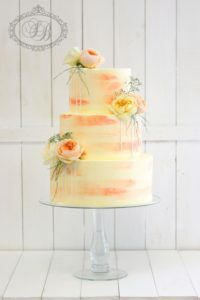 Be careful of choosing buttercream icing if you are having a summer wedding, however – buttercream melts very easily, and will only work if the cake is stored and served in a cool, air-conditioned venue. Fondant icing, on the other hand, is a traditional wedding favourite as it gives the cake a very smooth and polished appearance. Fondant is made from powdered sugar, corn syrup and water, melted together to form a thick paste. This paste is rolled out to become very smooth and is also rolled onto the cake, giving it it’s smooth, polished appearance. Fondant icing is also very flexible and durable, which gives us the ability to create elaborate and detailed designs. Most people unfortunately find fondant icing quite polarising – once dry, it has a chewy texture, and is sugary in taste. Fondant is very easy to peel off a cake, and it is common for wedding guests to remove the fondant icing choosing to just enjoy the cake instead. If you have always dreamed of having a clean, smooth, polished looking wedding cake, you should opt for fondant icing. Buttercream can be smoothed out, but will never give the ultra smooth appearance fondant can. If you have always wanted elaborate designs such as draping, patterns, characters, or bows, we would definitely advise picking fondant. A fondant covered cake is also the more likely to survive in summer temperatures, and if the cake needs to travel further afield, fondant would be a good choice – unfortunately ganache or buttercream might not survive the trip! Ganache is made by mixing chocolate and cream together, making it possibly one of the most delicious icing options available! Yum! Ganache can be spread over cakes to achieve a smooth, silky finish. The texture won’t be as smooth as fondant icing, but will be smoother than buttercream. Using white chocolate ganache will achieve a natural looking cream colour, however we can colour to your preference using gel colourings. If you are having a summer wedding, ganache is a better option to pick over buttercream as it is slightly more stable in hotter temperatures, however can still be slightly temperamental. It is worth noting that we put a layer of ganache underneath all our fondant and royal iced cakes, so if you want the sleek look only fondant or royal icing gives but don’t want to compromise on taste – don’t worry, you can have the best of both worlds! Royal icing is made from sugar, water and egg whites. Similar to fondant, the use of egg white allows royal icing to dry to a hard, matte finish –making it extremely stable in all conditions. 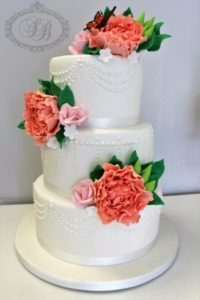 It will stay firm for a long period of time, which is why royal icing is the most popular choice for destination weddings, or for long periods of travel. Royal icing is also pure white in colour, making it perfect for the all-white wedding cake, or a great blank canvas to colour! Royal icing is great for making designs in advance to put onto the cake, however is quite restricting in terms of design. It is similar in taste and texture to fondant icing, which is why we use ganache underneath for a delicious flavour. No Icing? No Worries! Try a Naked Cake! Naked cakes have become extremely popular over the last couple of years – they are simply cakes with no outer layer of icing! They show off the cake’s natural texture and filing. 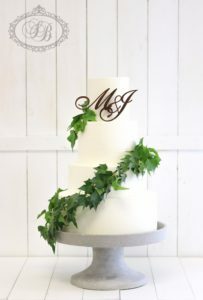 Naked cakes feel very natural and organic, and would suit a similar themed wedding. Although there is no outer layer of icing, we make up for it with an extra yummy filing, and decorating the cake in beautiful fresh flowers, fruits, caramels… the possibilities are endless! 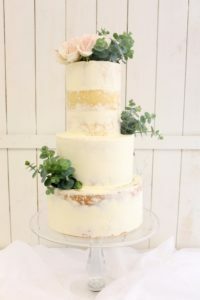 Naked cakes do dry out quicker than other iced cakes, however – so it is important the cake is served no longer than 24 hours after being stacked. We also recommend semi naked to stop the drying out – this is a cake that is slightly iced, yet still showing odd the cake’s natural texture, as pictured. 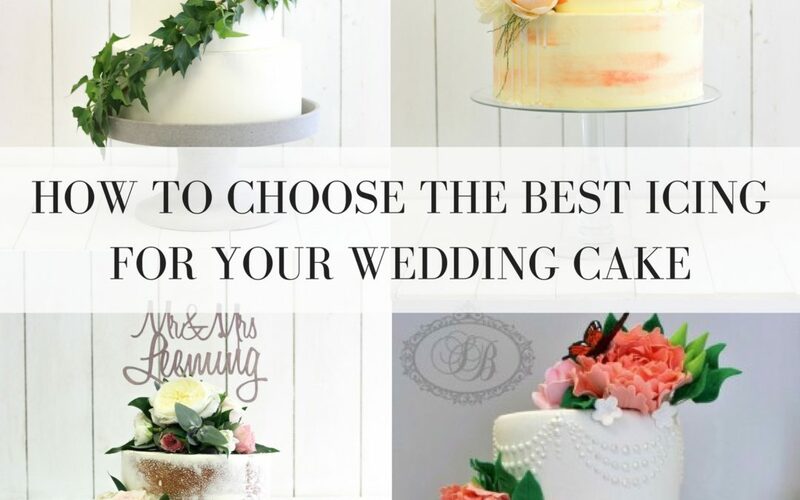 We hope this post has given you an idea as to which kind of icing you would like for your wedding cake. If you have an elaborate design in mind or you still need help making the final design – we would be more than happy to talk you through it! Feel free to send us an email at info@sweetbitescakes.co.nz or give us a call on 09-836-8806 and we would be happy to assist you! You can check out our previous wedding cake designs here, or if you would like to book a wedding cake consultation, you can do so by visiting our booking page.